Conservatives are starting to worry about income inequality. For real. Put simply, a severely skewed income distribution harms the pace and sustainability of growth over the longer term. It leads to an economy of exclusion, and a wasteland of discarded potential. Why do so many ordinary folks vote to help the rich and hurt themselves? 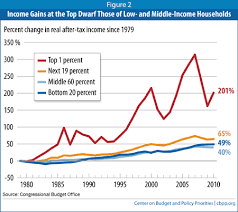 Why do those on (or who will be on) Social Security and Medicare vote for Romney and Ryan? Ryan calls Social Security a Ponzi scheme, a collectivist system that we should end. Romney wants to turn Medicare into vouchers, which won’t adequately cover costs. And if you’re old and in the private market, who will insure you, anyway? Romney complains about people who pay no income taxes – the lazy 47% — and says everybody should pay them. Unless you’re an investor. Ryan wants to bring the capital gains rate down to 0. Then Mitt wouldn’t pay income taxes, either. One of my friends who’s uninsured hates Obamacare, but now his daughter’s in the hospital. Another guy I know is blind but he’s a Romney fan. Since Romney will cut all spending outside of defense, Social Security and Medicare, this guy will be out of luck. Turns out, people tend to see through the eyes of the privileged because the privileged have more control over ideas. They own television and radio stations, newspapers and magazines. They run government — and get campaign contributions from wealthy donors, who expect something in return. They fund think-tanks to create an acceptable message. Billionaire-owned Fox News and friends then spread the word. Example: A wealthy Wall Street businessman makes a big contribution to his local member of Congress. He has a conversation telling her that a low rate on capital gains will encourage investment (a message created in think tanks). There’s no proof of this, but the excuse will do. Fox and friends then spread the word. Now repeat over and over so that people begin to believe it. These folks just don’t fund think tanks or have the campaign cash to change the tax rate. For good measure think tanks message claims that minorities take money – in the form of welfare – away from hardworking whites. Welfare uses less than 1% of the federal budget. But it’s a great distraction from the redistribution of wealth from the middle-class and the poor to the rich, via outsourcing, offshoring, union-busting, technology replacing workers and failing to raise the minimum wage, for instance. (Not to mention big tax cuts, loopholes and shelters for the wealthiest). Do everything you can to exaggerate the disincentive effects of higher taxes, while trying to convince middle-income voters that the benefits of government programs go to other people. And at the same time, you’d do everything you can to disenfranchise lower-income citizens, so that the median voter has a higher income than the median citizen. Ah, but what if the truth comes out? Easy-breezy: Warn against academics, liberal media bias, and fact-checkers so that folks will continue voting in the interests of the rich and powerful, and against themselves. 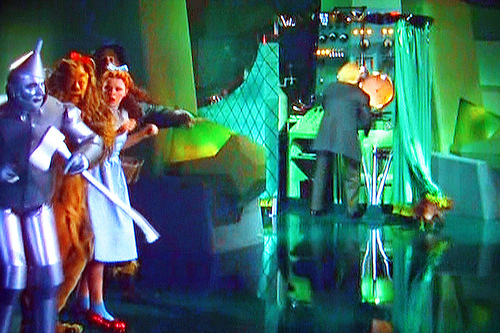 Pay no attention to that man behind the curtain, Dorothy.